...a bunch of pointless drama follows. This seems like your typical wish-fullfilment series for shy girls who want to date the hottest, most kind guy in the school - or for the guys who for whatever reason want to "tame" a wild girl, or to "conquer" the one girl who doesn't let anyone approach her or something. At first Mei and Yamato's dynamic was to me funny and kind of sweet: I get kicks out of getting into the shoujo mood and blushing at the flirting done well (sometimes) and laughing at the overly cheesy lines (most of the time). These kids are also adorably clumsy with their love, which would be understandable for two beginners. But as the series progressed and Mei evolved from her guarded self into a more open and kind person - her real self, I suppose - it really became apparent how she really is kind of a bland character. Almost too realistic, especially since the plot has half the guys fall madly in love with her for the smallest reasons which wouldn't usually happen for a plain girl or guy. I've seen other series where the guy tirelessly pursues the heroine, but this time there wasn't much kick to their relationship. As soon as Mei kind-of-willingly became his girlfriend, there wasn't much tension between them, sexual or otherwise. Or there was, but it was just so immature that it didn't quite get to an adult like me on this side of the screen. In short: instead of having an interesting relationship they just kind of misunderstood tiny things and worked themselves up over nothing often, only to have it all smoothed out at the end of each episode. The final episode especially was a real letdown, as nothing really happened and during most of the episodes the two main characters hardly interacted. A lot of their conflicts throughout the series was blamed on petty scheming from outsiders (which is normal in this genre, but still a bit boring and not very deep). When Kai stepped in I wondered if he would be more interesting as the male lead, or if Megu was going to change into a more interesting character than our female lead Mei as she showed signs of cracking. I know I sound like I hated this anime, but that's not it. It had a really tender and sweet atmosphere that sometimes made me happy and sometimes kind of wistful. I often found myself genuinely feeling sorry for a character, or wishing I was in love like they were. This was something nice and fluffy to watch when I wasn't in the mood for anything too heavy or fast-paced. I have no complaints about animation, voice acting or any other specific technical aspect... just the more boring kind of drama in the plot every now and then. If you find this disappointing, read the manga. I like to read and watch all kinds of any rom/com. Say I love you aka Suki tte ii na yo, the anime is a meh. However the manga was really well done. Also, shoujo animes are little promotions to make the watcher read the manga. I don't really recommend watching the anime, however I definitely recommend reading the manga. So I'm a heavy Shoujo fan thanks to 90's Sailor Moon (i AM Usagi). i loved this series, although the ending could have been more. the series follows this new, but odd couple (if you were an outsider) Mei & Yamato. Mei has rightfully shunned herself from the rest of the kids because people turn on each other so quickly. While Yamato is popular and most wanted and can blend into any clique at school. i like the series because there are some GREAT gems for the young people to pick up, manners for 1, also how quick people turn on each other when it doesn't benefit them, how you wont get what you want, holding grudges internally isn't healthy. Just a lot of life notes in this. i wished it had ended differently but those are the breaks. 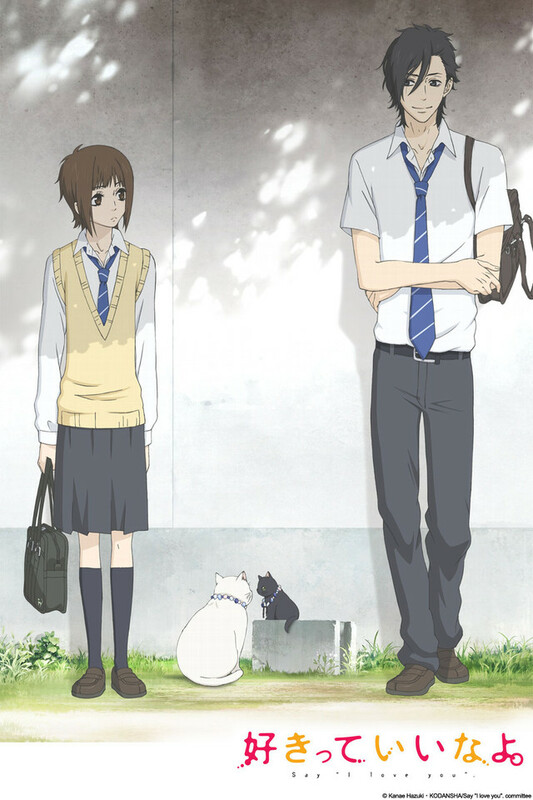 If you like cats, are a sad boy, sad girl, happy boy or happy girl, you will like this show. Even if you don't like cats, you will probably still like this show! I could watch this anime many times and not get tired of it. The best time to watch it is during rainy days when you're upset, or just need a chill time for yourself. Will definitely get you in the mood to cuddle lol. But yes, best anime if you are looking for something mellow dramatic and sweet. I won't be giving this anime five stars, and I'm not quite sure why that is. I think my main issue with it was the slow pacing, and how it was ineffective to communicate with me specifically. That being said, this is a very fine anime, I enjoyed watching it and I believe that if you're into slice-of-life character dramas, this will be right up your alley. This anime is great for a variety of reasons, but my top is how it portrays certain things pretty realistically. At least from my point of view. The characters are great and sweet. You learn a few things about them and it just makes them that much more endearing. Darker show when you really think about it. So I fell in love with this show when it first came out because I thought the artwork was phenomenal the character development through the main characters and side characters were amazing as they each go on their own journey throughout the entirety of the show. A couple of years later and I decided that I had to re-watch this show and after seeing it again I can't believe the dark undertones this show has through a lot of the backstories. Obviously Mei has a very dark past being shunned all throughout high school, but many of the characters are tortured by a past that defines what their beliefs are. For a 13 episode series, it's amazing how much gets done, especially with the avoidance of that dreaded filler episode that you hate was included by the end of the show because that could have been used for more content therefore a better ending. In the end, you're left satisfied by what you've watched through the emotional roller coaster that is Mei and Yamato. The show is a must watch for anyone who loves drama, but not the indecisive main character who doens't know which love interest to pick and in the end decides to be single and enjoy time with his "friends". shoujo manga/anime usually has like 20+ chapters before the girl finally confesses to the guy, or before they kiss, or whatever, right? well for "say i love you", they get that right out of the way in the first two episodes. if that isn't perfect i don't know what is. as a longtime lover of the genre i always hate how characters would always hold back their feelings, and this just takes that right out. and the main protagonist is actually extremely likeable and realistic ! jesus christ !! this is so revolutionary i sat through every episode becoming more and more astonished. this is truly one of the best entries in this genre and i'll be damned if i don't try and get people to watch it more.